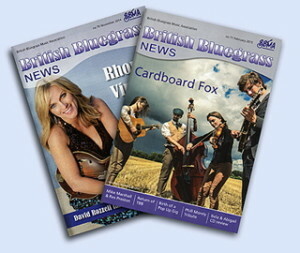 British Bluegrass News is a quarterly magazine bristling with information on the British – and wider – bluegrass scenes. There are interviews and features; CD & Gig reviews; think pieces on the history and the future of the music and some instruction content. All this, as well as all the latest news for all members of the BBMA. The magazine started as little more than a newsletter back in the 1970s and put together by Phil Morley, a subsequent founder member of the BBMA. It included Old Timey content alongside bluegrass. In the future, I would hope to see the magazine as a definitive resource for all things bluegrass, not just in Britain, but also in Ireland and into mainland Europe. We are developing contacts and cooperation with bluegrass ‘activists’ around the continent, and hopefully, we can be mutually supportive in ever-increasing circles, through publications, publicising members’ CDs and gigs and encouraging attendance at festivals. As Editor, I am open to any and all ideas when it comes to content. While it is a membership publication, I nonetheless want to make it a good read for the passer-by who happens to see the magazine at, say, a member’s house. So in that respect, I want it to reach out to the general reader, in which role I hope it can become a potential tool for recruitment.I would also like news of what Picking Sessions are happening around the country…do you organise/attend a session? Let me know and we’ll publicise it in the magazine, and on the website. And if you’re looking for a session in your area, then we’ll do our best to locate the nearest. In addition, I’m especially eager to receive gig reviews– we are a national organization and I want the magazine to reflect that. However, I am based in the south east, and don’t typically get to gigs in the north east, let alone Scotland…either west or east. So, please, if you have an idea for a review…if you’re attending a concert or a club, then don’t be shy, contact me and I will give you an immediate answer as to whether I’d like you to write it up for the BBN. Metaphorically, my door is always open.